We’ve integrated Live Chat into our system, making it easy for consumers to engage your dealership – live – while visiting your listings on RVT.com! Live Chat also proactively engages your visitors by inviting them into a conversation with your sales rep(s). Choose Skype or Google Talk, then enter the username for that service. IMPORTANT: Skype or Google Talk must be online when setting up, and you must ACCEPT invitation from Visitor 1, 2, 3, and 4. 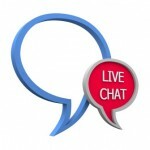 All your ads will now be set up for Live Chat! Please email Dealer Support or call 800-282-2183 x 702 if you have any questions or issues. And, if you are not yet an RVT.com Advertiser … what are you waiting for?! Request a free trial today to start benefiting from Live Chat and other powerful sales-generating features included free with every RVT.com Dealership Account.